When creating a slideshow, the most important thing is strong features to make your final presentation more dynamic. However, other factors are also important, such as ease of use, design, and accessibility. In terms of those criteria, Icecream Slideshow Maker is an absolute winner. This slideshow software is completely beautiful and so easy-to-use; a modern experience that makes building a slideshow an interesting thing to do. Users can add images one by one or by while folders from PC and get user-friendly tools for customizing the slideshow. 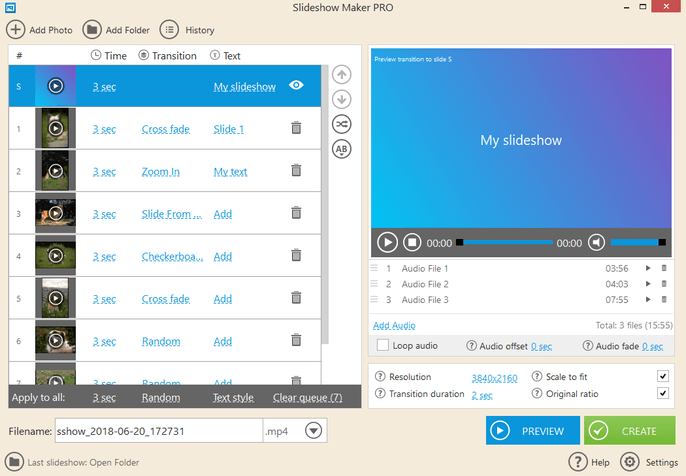 Such parameters as slide and transition duration along with the transition effects can be customized in this free slideshow maker. Icecream Slideshow Maker is free to use, with an optional premium version that gives more pro features. The program supports the addition of multiple audio files per slideshow; uploading of the created videos to Google Drive, Dropbox, and YouTube directly from the program; and offers the feature to burn DVDs with the slideshows, and even more. 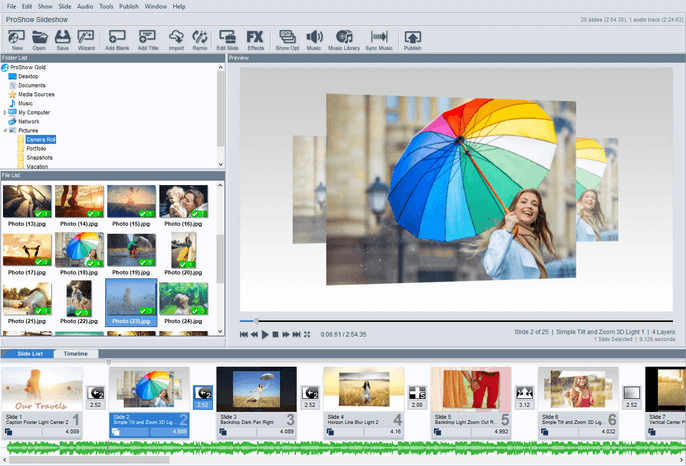 One of the best slideshow maker software is the easy-to-use ability for previewing photo slideshows before saving, while time and transition effects are also welcome additions. Of all the slideshow editing and creation apps we tried, Photostage Slideshow Software was the easiest to use with the simplest tools and instructions. This slideshow maker can deliver professional-level slideshows that are fully customizable to personal demands. Core features are on board, such as transitions, images, videos, music, and other media integrations. We also like the in-built photo editor of this slideshow maker, which is powerful enough to be a worthy dedicated editor for your images. Photostage Slideshow Software also stands out from the competition because its output options are more diverse than many rival apps. The only thing that hampers the overall experience is the slightly archaic and dated design and the fact the free version is time-capped to one month. Like Photostage, Proshow Gold is a limited-trial free slideshow software that you will need to pay for to use the features in the long term. Still, it does everything you want a consistent slideshow maker to do, including efficient use of media. Including movies, images, and audio is easy, while importing from social media like Facebook and Instagram is efficient. 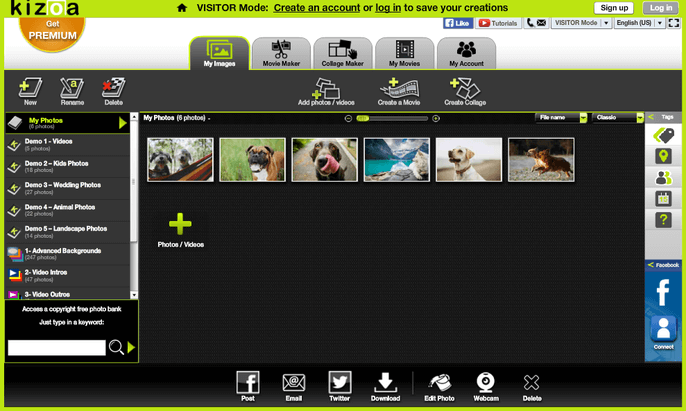 The app features very good integrated themes that you can choose to lead the design of your presentation. Additionally, Proshow Gold features a long list of royalty-free music that can accompany a slideshow. There are plenty of automated features that will appeal to beginners and pro-users alike; although you will only get these features for free for a limited time. Slidely is entirely web based and is completely free to use. The former of those has good and bad implications which we will discuss, but at its core Slidely is an excellent slideshow maker that anyone can use. 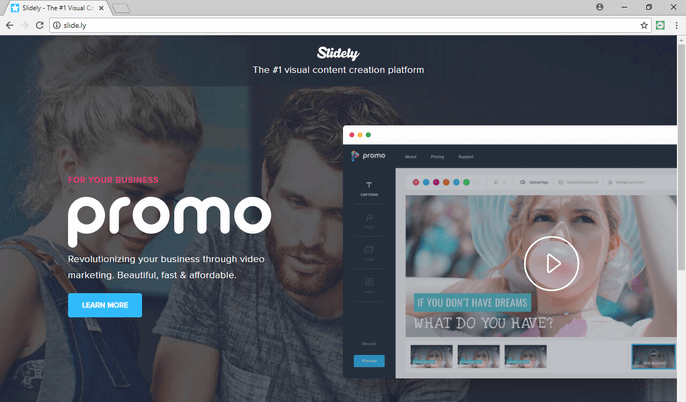 Being a modern web app, the slideshow maker is slick and contemporary, offering a stylish UI to carry out presentations with slick tools and a strong feature set. Connections to social media are at the heart of the experience, allowing easy integration of slideshows on Facebook, Instagram, YouTube, and others. The one clear limitation is that this is a web experience only. In other words, you must be connected to the internet to even use Slidely as there is no offline functionality or dedicated download. Kizoa is a free slideshow maker that is extremely easy to use thanks to its large amount of pop-ups with tips and information on how exactly to use this slideshow software. Kizoa supports using preset templates (grouped by categories) for the slideshows or creating them manually from scratch. The images can be uploaded to the slideshow software from your computer or from Facebook. There are 48 various transition effects and 58 effects that you can add to the pictures themselves. Text can be added to each slide, and there is a selection of various text styles that can be applied to the text with this free slideshow maker. GIFs and music (both preset) are also offered to add to the slideshows. The added images can be used as is and can be automatically centered and fitted to avoid blank sides in the videos. All in all it’s a great free slideshow maker to use. The only downside comes once you actually create a slideshow, preview it, and then opt to share the videos online, by email, save it as a file, upload it to YouTube or Facebook, or burn it to a DVD, as you will be asked to create an account for that. 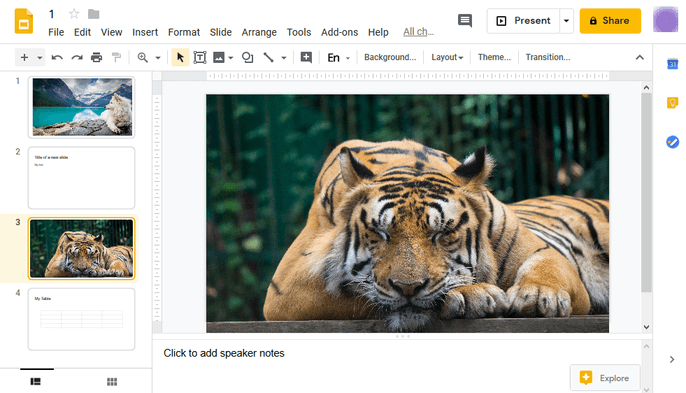 Google Slides is another great online free slideshow maker with a highly intuitive interface and a selection of 26 templates. If you don’t select any preset template, you will have a selection of blank slides to which you can not only add text and images, but videos, shapes, tables, charts, diagrams, lines, special characters, and animations too. The text added to slides of this free slideshow maker can be fully formatted (spacing, font size and type, alignment, etc.). New slides can be added with a single mouse click. The images can be uploaded from your computer, from Google Drive, or uploaded by URL. Another great feature of the slideshow software is the auto-save feature. All the changes made are automatically saved in your Google Drive account. Transitions between the slides can also be customized. The created slideshow can be shared by a direct link or you can invite people to view the slideshow by email. As for downloading it, Google Slides supports the following output formats: PPTX, ODP, PDF, and TXT. 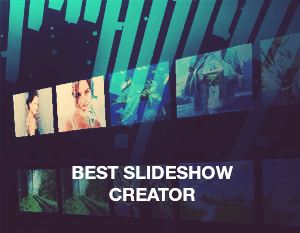 We think that any decent slideshow maker should come with some core features. The ability to integrate media like images, video, and audio are necessary to putting professional touches to your work. All the services on our list have this ability and a range of other features, such as social media integration, templates, and photo editing tools. 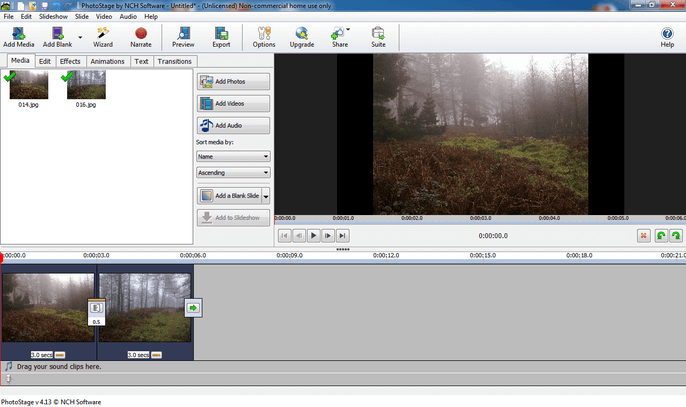 Turn to a free video editor in case you need to work on your slideshow video further. Tags: best slideshow maker, best slideshow software, free slideshow maker, free slideshow software, icecream slideshow maker, Movavi Slideshow Maker, photostage slideshow software, Proshow Gold, Slidely, slideshow software, slideshow creator. Great list, I’ve tried using Proshow, but in the end I switched to SmartSHOW 3D because it’s easier to use but just as powerful.